At the turn of the 21st Century, Star Trek fans had seen four different television series come and go, Star Trek (original series), Star Trek: Next Generation, Star Trek: Deep Space Nine, and Star Trek Voyager. Just when fans were settling into the idea of the hit-and-miss Star Trek movies as our only Federation fix beside reruns, Paramount announced a new series - Star Trek: Enterprise. First airing in 2001, this prequel of the franchise focused Earth's early days of deep space exploration with the commissioning of the first Warp 5-capable ship, the NX-01. In the four seasons that followed, Captain Jonathan Archer and his crew faced a variety of new as well as familiar adversaries and in the course of their adventures, beat the heck out of this poor spacecraft. It was only fitting that NX-01 would go back into the shipyards and receive some new features in addition to some long overdue repairs. Polar Lights has updated their 1/1000 scale NX-01 kit to incorporate a new secondary hull that houses a more powerful deflector dish (though the kit retains the original deflector on the front of the saucer section), a relocated engineering section to house a more powerful warp engine, and the addition of a shuttle hangar bay in place of the ventral shuttle launch bays. This kit is a relatively easy build and retains the parts and markings to replicate the original TV NX-01 (pre-refit) as well as this new configuration. Something else new in the box is one of Polar Light's dome display stands and the model has been modified to mount atop the stand, both in refit and original configurations. 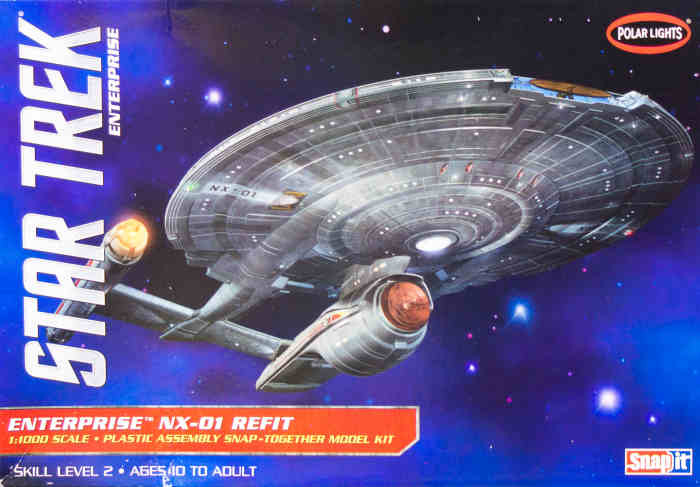 Markings are provided for the original NX-01 as well as the original NX-02 plus the additional markings for the refit NX-01. This looks like a fun build and I look forward to seeing how this turns out build-up! Stay tuned! My sincere thanks to Round 2 Models for this review sample!